Understanding why volunteers quit is important. Anyone who’s ever managed volunteers understands the constant challenge to recruit, train, and attempt to keep volunteers. Inevitably some volunteers opt to “take their talents elsewhere“. Losing volunteers can hurt team dynamics and limit synergy and growth. Taking time to find and train a new volunteer takes away from time spent casting vision and growing your program. Volunteer turnover is definitely a problem. I’ve been reading research on why volunteers quit for the past year or so. I plan on researching this topic over the next year. But, I thought I’d share a few factors I’ve found in the present research that contribute to volunteer turnover. One of the most interesting results in research reveals a connection between burnout and intention to quit. Burnout was often defined as emotional exhaustion. It appears a person will experience burnout before quitting. This is great news. If a person experiences burnout before quitting, then there’s a chance volunteer leaders can save people from quitting by protecting them from emotional exhaustion. 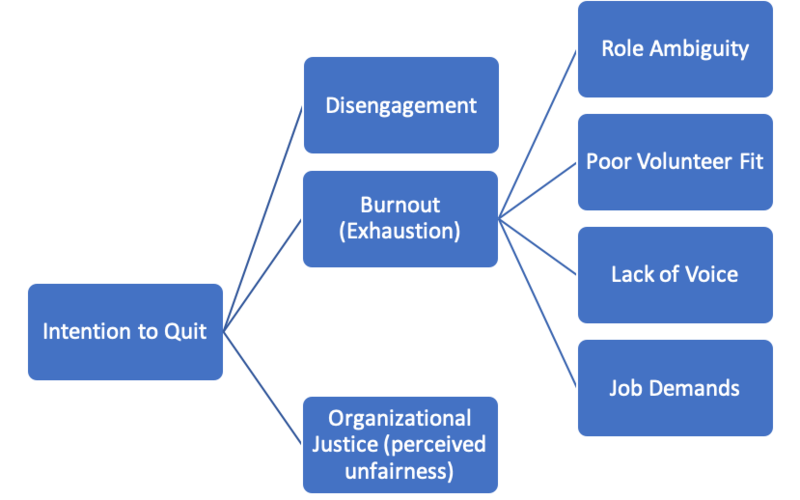 The experience of burnout also gives volunteer leaders time to intercept those moving towards quitting before they actually leave their position. Role Ambiguity: When a volunteer is not clear on what they’re supposed to do or how. Poor Volunteer Fit: This happens when a volunteer does not feel a good connection with their role or the organization. Lack of Voice: Volunteers perceive a lack of voice when they do not feel that their opinion matters or has the power to influence outcomes. Job Demands: This refers to the emotional strain of a task or job. Organizational Justice: When a volunteer perceives they are not being treated fairly or if there is any unfairness in their role. Addressing Quitting Behavior : If these factors contribute to volunteer turnover, then they can influence how volunteer leaders manage their volunteers. Leaders should begin thinking through volunteer energy and exhaustion. The goal should be to keep your volunteers as energized as possible. Keep tabs on how their doing, including any life circumstances that could increase energy drain. Find ways to add value to the life of your volunteers instead of always asking them to do stuff for you and the organization. Using the framework of exhaustion to determine the needs of your volunteers can be powerful. Besides using a leadership framework built around exhaustion, build your volunteer leadership around 3 C’s- Clarity, Communication, and Care. Check in with your volunteers to hear how things are going. Ask if they need anything. Open up communication. If a volunteer suggests anything, see if you’re able to implement their suggestion. Finally, care about them and their ideas. We will never stop the flow of volunteer turnover. Sometimes volunteers leave for no reason. They may move, or be bored, or are no longer able to fulfill the time commitments. But, as volunteer leaders we should focus as much energy into retention as we do in recruiting. p.s. I wanted to add one more interesting research tidbit. One study also measured “spirituality” as a variable. They found that being higher in spirituality did not keep a person from experiencing burnout. But, those higher in spirituality, who were experiencing burnout were less likely to quit. Very interesting. I meant to mention that role ambiguity is also linked with volunteer disengagement.